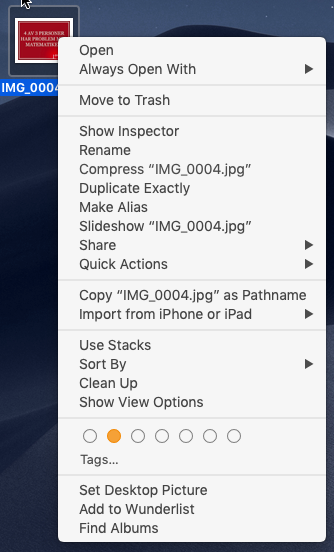 I have seen several blog posts and articles about how to create context menu items in Finder and have been motivated to try creating a Context Menu (right-click) Items inside the Photos app. 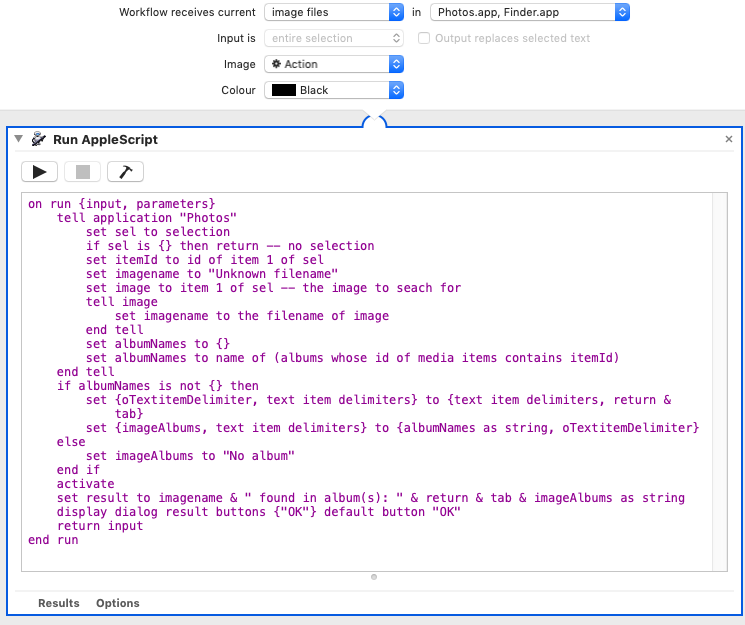 Using Automater, I created a workflow using an Applescript to find what albums include the image selected. In the workflow header I say that the Workflow receive current 'image files' in 'Photos.app + Finder.app' Please see picture below. The result is that the new context item is shown in the Finder.app (at the bottom = "Find Albums") but not in the Photos.app as can be seen in the other pictures below. I don’t know how to save this script into Photos.app to get it to activate. What setting allows my script to be seen in Finder and not in Photos? As far as I know, applications handle the right-click context menu on their own and there is no way to modify it. 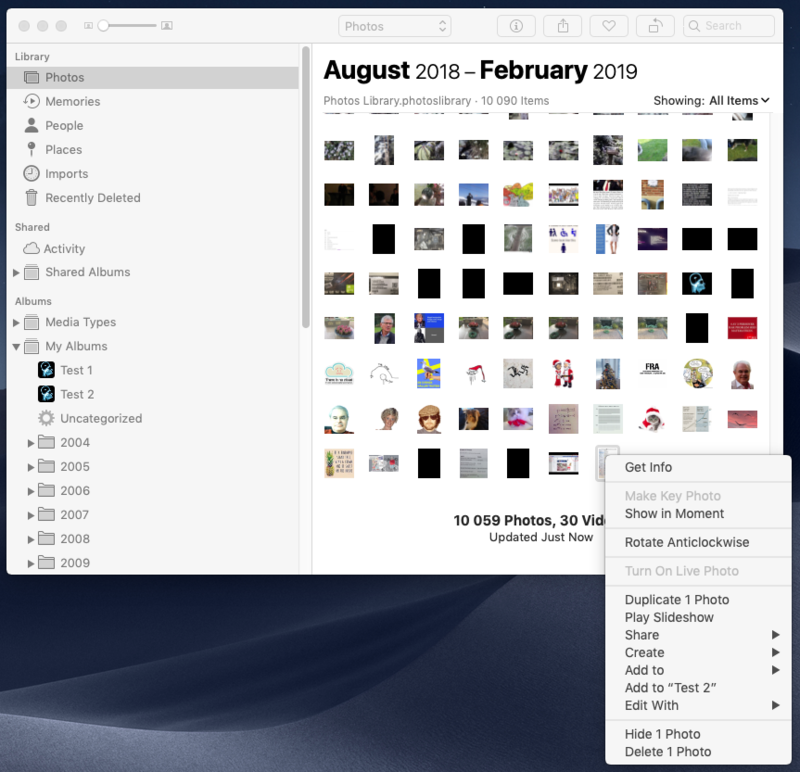 The general way of registering a service or having an application add a context menu entry only works for Finder (possibly also for other system contexts, but not Photos), which allows extending the menu. Not the answer you're looking for? Browse other questions tagged macos photos.app automation shortcut-menu . How do I remove duplicate “Open With” context menu items in Finder.app? How do I remove the “Open With”context menu items caused by VMware Fusion? Remove entries from finder's context menu? How can I create custom right click context menu items in Mountain Lion? (“New File”, “Open Terminal Here”, etc.)? how to add button to Finder toolbar to call python script with current folder as argument? Photos (OS X Yosemite / El Capitan) – show original in Finder? How to import Live Photos from Finder to Photos.app?